The Eco-Snow WaferClean® 2100EX+ system removes particulate contamination, post-etch veils and fences, as well as thin-film organic residues from Silicon, Compound, MEMS and MR Head wafers. 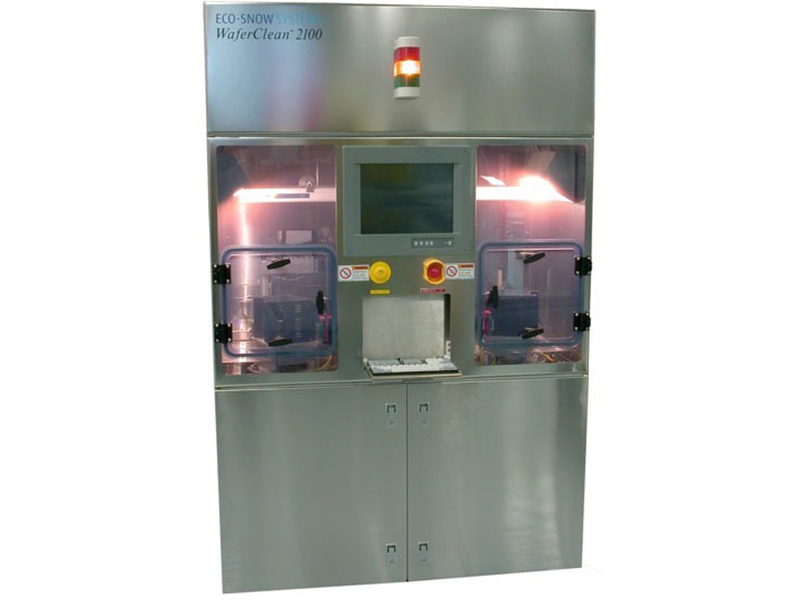 This is a stand-alone, automated CO2 snow cleaning system designed to accommodate wafers and pucks as large as 8″ in diameter or 8″x 8″ square. The multi-nozzle design enables the user to select the optimal nozzle for the application at hand. An ULPA filter and fan module is used to maintain an ultraclean (Class 1) environment inside the stainless steel cleaning chamber. Applying a very cold stream of CO2 causes the veil material to shrink and debond from the device features. Further physical pressure of the cryogenic particles breaks any remaining bonds and sweeps the particles off the surface leaving a completely clean, veil free devise. The impact of CO2 Snow dislodges small particles which are then swept away in the stream of CO2 gas. The Eco-Snow cleaning process can remove particles as small as 50 nanometers. The metal layer undergoes a rapid contraction due to the chill of the CO2 spray. The contraction causes film delamination at the interface with the photoresist layer beneath. The CO2 snow peels the metal from the photoresist leaving the desired pattern exposed. When the CO2 Snow impacts a surface contaminated with an organic film, it forms a transient dense phase boundary layer, then it rebounds off the surface carrying the contaminant with it. When the spent CO2 leaves the system it sublimes completely, eliminating the need for drying and for disposal of waste solvents.